The point of this site has never been to deliver you overwhelming statistical analysis. That’s me being honest and directing you to the likes of Ken Pomeroy and Luke Winn or some of my go to pals, @jgisland and @ontheproviso. These are gentlemen who excel at Excel. Knuckles. Me? I’m really damn good at watching the game and knowing that four points per game is fewer than fourteen. A regular Bill James here folks! But let’s focus a touch deeper. I’ve always been curious about when a player makes his biggest leap. When he goes from scrub to star, role player to role model. And this has piqued my interest because the Pac-12 has some interesting pieces getting older. Players who’ve performed well or hardly at all to date and I want to know – essentially based on anecdotal evidence (i.e. what I like to call tempo-full stats) – who we can expect big things from? Who’s going to make that leap to leader and usher his team from a Pac-12 team to the Pac-12 team. To examine such, I compiled an arbitrary list of 21 Pac-12 players who participated in at least three seasons. The list itself was fun to build. Example: Did you know Brian Scalabrine went for 14/6/2 in 31mpg as a pup? That’s ridiculous. Do you know what Colorado fans would give to get that from Josh Scott? Or what UCLA fans would do to get those minutes out of Josh Smith – a top-5 offensive player in the conference? 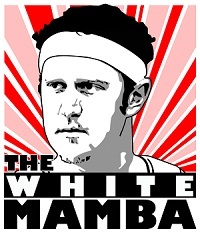 Alas, not every incoming player will put up White Mamba numbers but that’s what we aimed to look at here. I was disappointed to find that there weren’t ORtg numbers going as far back as I’d like so I ran with good old fashion points/rebounds/assists and gut analysis. That’s to say, I built the spreadsheet and looked at the numbers and thought, “Yeah, those look better than those,” then highlighted the year in which the player’s numbers took the biggest jump. 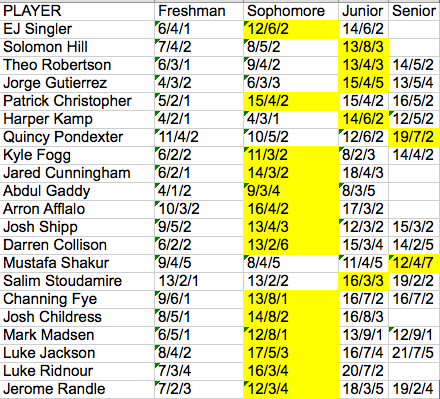 From this chart we find that 14-of-21 three year players showed their most dramatic statistical jump (most notably in points per game) from their freshman to sophomore year. Five players had their biggest jump from sophomore to junior and two players leapt into their senior year. One player had an arguably lesser sophomore season. Three players had arguably lesser years as juniors. That’s the black and white look. The Second-half-of-the-Wizard-of-Oz look (colorful) directs me to the Pacific Northwest and Abdul Gaddy. With this now senior, we find that his numbers didn’t quite high jump from FR to SO, but they did improve (4/1/2 to 9/3/4). But what I found most interesting is that his ORtg jumped 40 points – from 85 to 125. Ok, ok, it’s not fair to just throw ORtg stats into the equation all of a sudden but 40 is significant. It’s also not fair that Gaddy only played 13 games while recording that 125. But I’m not gunning for a Nobel Prize here. I am, however, interested to see that guys like Patrick Christopher took his freshman year to develop into a consistent player. Dude put up essentially the same, very solid numbers for the three years following his debut at Haas. As did Arron Afflalo, the infamous Lukes, Channing Frye, and Darren Collison. Some terrific Pac participants. What this says to me is that, above all else, players grow in confidence. Sure their minutes grow but I keep coming back to Gaddy and his improved output as an offensive player. He just became better at being a basketball player. He didn’t necessarily do more, he just did it better. 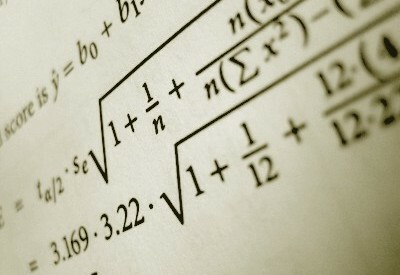 The numbers can also show us that this perceived confidence comes at different times. Look at Quincy Pondexter and Jerome Randle. QPon perplexed and frustrated Husky fans during his tenure in Seattle but when push came to shove, he had a dynamic senior season. That’s the kind of stuff I love. That’s the fairytale stuff when the beleaguered vet wills his team to big things. He followed no traditional path but when you record 19/7/2 and lead your team to the school’s fifth sweet sixteen, you figured it out. And in the nick of time. As for Randle – the conference’s POY in 2010 – he appears to have been the perfect recruit. He incrementally improved every year, stayed four seasons, and lead the school to a conference championship. What more could you ask for? OK, a national championship I suppose, but Randle did work year-in-year-out and it showed. But I’ve been sidetracked from the topic at hand – biggest statistical leaps – and what we can learn from my spreadsheet. My conclusion to this conundrum is that players make their biggest leap – as I suspected – from their freshman to sophomore season. Again, I’ll make no bones to the arbitrary nature of this analysis but I like my answer. Askia Booker and Spencer Dinwiddie are two of the first names that come to mind as I looked over these numbers. This tandem put up 9/3/1 and 10/4/2, respectively, and will only have their 2012-13 roles grow in the absence of Nate Tomlinson and Carlon Brown. At this point you know he can hop and defend and heard rumors he can shoot. But this is the year that all of those things should come together for Nick Johnson (9/3/2), Arizona’s presumed starting two-guard. He played confidently (reason #1 for anyone’s improved anything) in the Red-Blue scrimmage and is poised to shine. What I like most about David Kravish (7/6/1) – and what I think is the most significant marker of his forthcoming FR-SO explosion – is he played his best ball when the Bears lost Richard Solomon. He closed the season averaging 8 & 6 in Solomon’s absence, including an 18 rebound performance at USC. Confidence gained as a successful contributor and the return of Solomon should allow the lanky big to thrive. So…it’s going to be a tough one in Pullman unless this guy – DaVonte Lacy (9/2/2) – takes the leap. But he’s a got a great mentor as Brock Motum blew up into arguably the most efficient player in the universe (SO-JR). With Reggie Moore gone, Lacy is going to have plenty of chances to show off just how well his summer workout routine worked. I’m not mentioning the likes of Chasson Randle (14/3/2) orByron Wesley (10/5/2); two very interesting players. Randle is going to be good – scary good – and so I’m not going to bother reiterating that. Wesley is no doubt solid but finds himself in a completely revamped lineup and while my “study” took into account exactly zero extenuating circumstances, Wesley is playing in an extenuating circumstance. I’d also keep an eye on Norman Powell (5/2/1), Angelo Chol (2/2), Stefan Nastic (2/1), and Jonathan Gilling (7/2/2); players with emerging roles on each of their respective teams. Look, this conference is back. The stage is set for a lot of this talent to emerge and if you look at the crop of sophs in the league compared to what their predecessors have accomplished, it’s my impression that the good kind of parity is back.